Brilliant but despicably cynical view of human obsession and the tendency of those in love to try to manipulate each other. Stewart is excellent as the neurotic detective employed by an old pal to trail his wandering wife, only to fall for her himself and then crack up when she commits suicide. Then one day he sees a woman in the street who reminds him of the woman who haunts him... Hitchcock gives the game away about halfway through the movie, and focuses on Stewart's strained psychological stability; the result inevitably involves a lessening of suspense, but allows for an altogether deeper investigation of guilt, exploitation, and obsession. The bleakness is perhaps a little hard to swallow, but there's no denying that this is the director at the very peak of his powers, while Novak is a revelation. Slow but totally compelling. Yes, some of the shots that are supposedly done in the gorgeous San Francisco outdoors are awkwardly filmed on a cheap-looking set, but don't let that stop you from watching one of the weirdest, and most Freudian and compelling films that Alfred Hitchcock directed (and that's saying a lot). Stewart is Scottie, the former cop suffering from vertigo due an unfortunate police chase, who is hired by a concerned husband to follow the apparently suicidal Madeleine, played by the stunning Kim Novak, supposedly haunted by her ancestor Carlotta. But the plot really thickens, even though Scotty's real love Midge, played by the sexually frustrated Barbara Bel Geddes, tries to protect him. 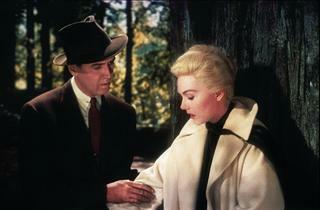 The sexual chemistry between Stewart and Novak is palpable, and clearly Hitchcock did have a thing for blondes, and unusually in this film, he lets the audience into the plot's big secret while Scottie remains clueless and becomes increasingly obsessed with who and what he thinks Madeleine is and was. The music is remarkable, the to leads are mesmerising, and it's not hard to figure out why this was apparently Hitchcock's favourite film. Direction and the male lead in this film are fantastic. Despite the ending being made fairly obvious, and the Evil Monologue, the acting surpasses the flaws. Not as good as Transformers. Went to see this at Tyneside Cinema recently. Ruined by the quality of the print. So hazy you could not even make out people's faces. Complained by e-mail about this to the Tyneside Cinema, guess what! Not heard back. I'm with "neon messiah" on this one. I like Hitchcock films, but I wouldn't give this 5 stars. I saw "Vertigo" at BFI - interestingly the flyer they give out giving background to the film was written by a film lecturer who said he wasn't overly impressed with the film the first time he saw it. Doesn't cut the mustard compared to modern thrillers, but good to see nonetheless. A case of the emperor's new clothes I'm afraid. Interesting in parts but highly overrated movie and a terrible ham fisted ending. The first film in what is perhaps the greatest trilogy of all time. A masterpiece. The first time I saw this film I didn't like it at all. It seemed over-extended and akward in conception. Now I think it must be the best Hollywood film of the high cold war period. Noirish vision has been replaced by a slightly numbing order of prosperity and chilly natural and urban beauty. 'Crime' is denuded of any degrading detail. Intent is completely mute and obsession seems more real because its so matter of fact. 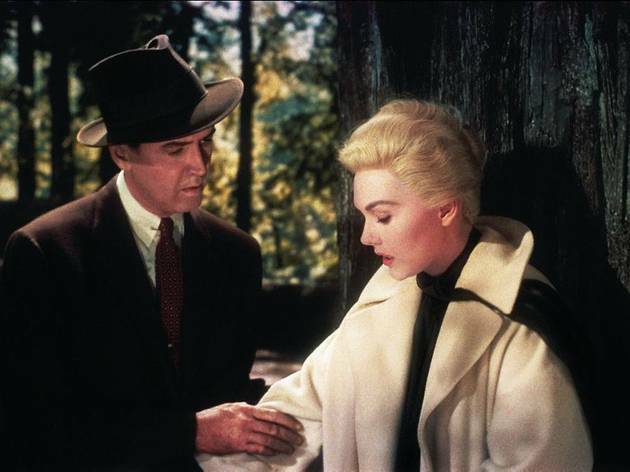 For me, somehow Vertigo reflects American confidence and determination while plumbing its darker contradictions creating a world where everone and everything is suspect. Kim Novaks' performance is pure visual metaphor -- a once in a lifetime role, like Louise Brooks as Lulu in Pandora's Box. A fascinating study of human obsession. I completely agree with Time Out, it does lose itÂ´s intensity, but keeps the viewer interested.